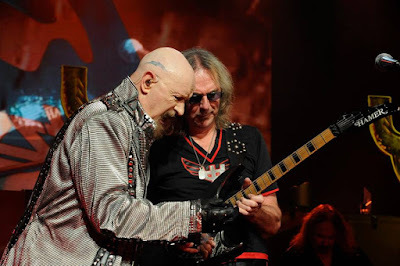 Glenn Tipton joined Judas Priest to perform the encore during the band’s June 10 concert at The Royal Arena in Copenhagen, Denmark, and video from the event is streaming online. In the lineup for the classic tracks "Metal Gods", "Breaking The Law" and "Living After Midnight", the show marked Tipton’s second live appearance with the band during their recently-launch European tour in support of their 18th album, “Firepower”, following a similar slot a day earlier at the Sweden Rock Festival. Tipton announced his retirement from the road earlier this spring following a diagnosis of Parkinson’s Disease that has affected his ability to play guitar; the rocker personally chose album co-producer Andy Sneap to take over his touring duties, while managing to make several appearances during the group’s spring trek across North America. “By now, many of you will know I won't be doing the Judas Priest tour because of health issues,” explained Tipton in March. “I’m so sorry, but four years ago I was diagnosed with Parkinson's and was told by my specialist that I had already had it for over ten years. I knew something was wrong with my co-ordination and fluency regarding my playing but I worked around it and battled on; I have good days and bad days but the disease is degenerative and I would never want to compromise the greatest metal band in the world. “I have been overwhelmed by the massive support and love I’ve had from other artists and from fans all over the world and from many friends and metal maniacs out there,” added the guitarist. “It's not the end for me: I’ll still be able to write and record and, on good days, even join the band on stage for a few songs. With new medication and advances being made who knows what the future holds, but one thing's for sure - it will certainly involve Priest!